This page links to excerpts of different articles and books, or of works in progress that can contribute to exploration of concepts in traditional thought. It is to be constantly updated and expanded. The Quintessential Sincerity of the Therapist. Emotions according to the Chinese Early Philosophical Texts. Emotions according to the Huangdi Neijing. 和 - he : a short study of the character and the notion of Harmony. To treat - 治 zhi : a short study of a series of the character and the notion. An interview of Elisabeth made for Dragon Mouth in 2005, Issue 4. Numerology : a short presentation of the first ten numbers, with their character and their symbolic value. 志 zhi : A Manyfold Will, an article published in Jingshen, Issue 3, Sep 2008. Art of the Heart : notes taken by Sandra Hill from a talk given by Elisabeth at the Pacific Symposium in November 2002 on the Chinese concepts of heart, the spirits and the emotions. Elation and Joy - 喜樂xi le, translation from the French by Laurence Mourey. 神 shen (spirit, soul) in Chinese Religion and Medicine. This paper is the Charles Strong Trust Lecture for 2012 and was given in Melbourne in August 2012 thanks to the invitation of the Charles Strong Foundation. The Practitioner-Patient Relationship: Notes compiled by Edna Brandt from a seminar by Claude LARRE et Elisabeth ROCHAT, held in 1990 at TAI. 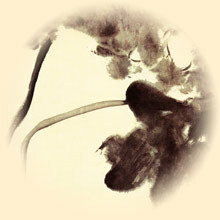 The Concept of Shen 神 in Traditional Chinese Medicine: a 2012 interview. A superb text written by a dear friend of mine, Raven Lang, on an extraordinary delivery. Three short videos in which my old friend Alan HEXT, a practitioner for nearly 40 years, talks about what he found to be the most important in his learning and practice.